In my pursuit for the latest Apple product, I found myself in the mall. It was rather entertaining. Not so much the pursuing the latest Apple product, but people watching. At first I was annoyed that so many people decided to show up to the mall on a Saturday. The nerve. Doesn’t everyone know that I have a short window of time and I don’t want to spend it looking for a parking place, walking two miles because I had to park in the adjacent lot, or dodging in and out of foot traffic because most people are out for a leisurely stroll? Doesn’t everyone know that the world revolves around me?!? Oh, that’s right, the world, in fact, does not revolve around me. That makes me feel better, I was starting to think the universe was conspiring against me. Back to my people watching. Trips to NorthPark Mall are few and far between. It’s not super close and not in the general direction I am usually driving. So, when I go, I have to check out some unique stores that only exist in this mall, like H&M. If you’re not familiar with the concept, it’s a European fashion retail chain that produces in style items inspired by current runways at a low cost. Of course that usually means that the material is not the finest Angora wool, sourced from Italy or hand-crafted in France. Don’t get me wrong, those high fashion items are great, but who wants to pay $70 for a tank top when I can get one from H&M for $7? Is that $70 tank top stain repellent? Will it make me look 10 times thinner, or give me more muscle tone? No! Will it be used as a snot rag or napkin at some point? Yes, sadly yes. So why pay $70? This particular H&M is a temporary store, so there’s not a huge selection, but it’s still worth it to swing by. I picked up a cute navy skirt for $17. More importantly, I spied a small selection of kid’s stuff. Nothing earth shattering, but totally worth it should we need some basics in the future. The girl’s selection was a little blah in my opinion, but I did really like the striped dress shown in the pic. And they had the most adorable jeggings, but since Lola already has 3 pairs I had to pass them up. 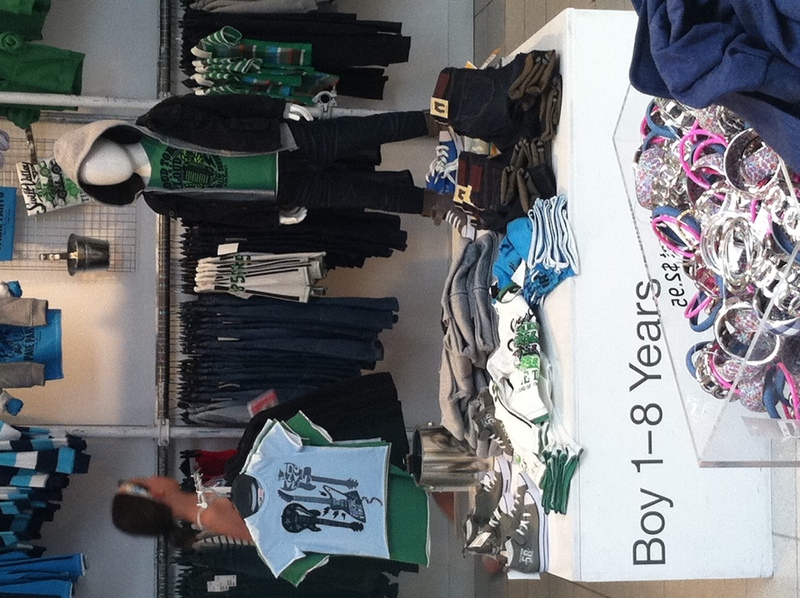 The boys collection – I loved! Loved the graphic t’s, high tops, hoodies. If only I had a boy. If you’re in the neighborhood check it out. This entry was posted in Kid's Style, My Favorite Things, Shopping. Bookmark the permalink.